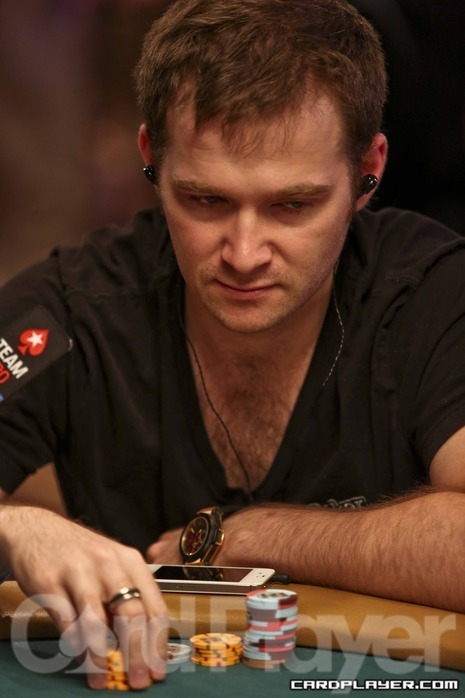 Davidi Kitai raised to 60,000 preflop and Cary Katz reraised to 160,000. Kitai reraised to 360,000 and Katz reraised all in. Kitai called and they tabled their hands. 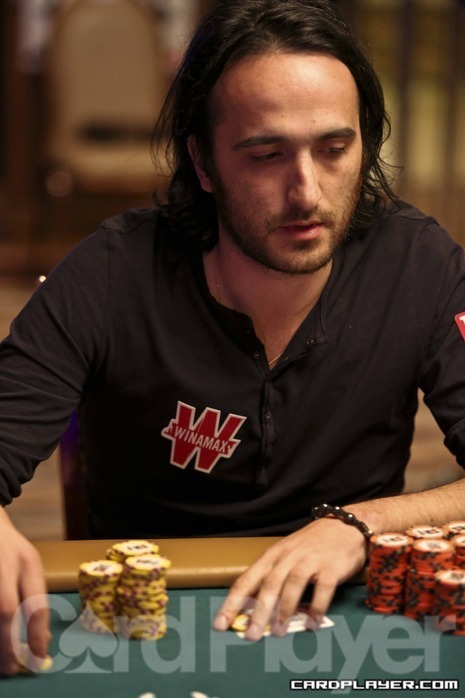 Katz was eliminated on the hand in second place when Kitai spiked a jack on the flop. Katz took home $138,794 as the runner up and Kitai won the tournament. Kitai took home his second gold bracelet and he was awarded $224,560. Cary Katz raised to 50,000 and Eugene Katchalov reraised to 174,000. Katz reraised all in and Katchalov called. The two players then turned over their cards. Katz won the hand with pocket queens and he grew his stack to 800,000. Katchalov was eliminated in fifth place. Dimitar Danchev raised to 84,000 under the gun preflop and Vincent Bartello reraised all in. Davidi Kitai called and Danchev called all in. The three players then turned up their hands. Kitai won the hand with a pair of nines to take a lead of 1.98 million into a heads-up final against Cary Katz (945,000). Danchev was eliminated in fourth place and Bartello was out in third place. The final table of Event No. 19 ($5,000 Pot-Limit Hold’em) has begun, and Card Player will be posting level-by-level updates with all major hands, current chip counts, and prize payouts. Chris DeMaci and Cary Katz got involved in a preflop raising war, with Katz opening to 600, DeMaci re-raising to 1,550, Katz four-bet it to 5,100 and DeMaci then five bet to 9,000. Katz moved all-in for 33,000 and DeMaci snapped called with A A . Katz confirmed the cooler when he rolled over the K K . The board ran out Q 8 7 6 10 , giving DeMaci the nut flush to win the pot and send Katz to the rail. DeMaci now has the current largest stack in the room with 92,000 in chips. A short-stacked Frank Rusnak has just doubled through Cary Katz. Rusnak moved all in from the button for 40,700 with K 4 and Katz called from the small blind with 6 6 . Katz stayed ahead after a flop of J 8 7 . Ruznak picked up a pair of fours when the 4 fell on the turn but was still behind. The river changed it all when the 4 was revealed to give Ruznak trip-fours and best Katz’s sixes. All of the money went in preflop with Trevor Pope holding the 8 8 and Cary Katz the A K for a classic preflop race. Katz was behind but caught up on the river when the board ran out Q J 5 3 K . With that Pope was eliminated from the event, while Katz grew his stack to around 200,000. Larry Wright’s table, which also includes Cary Katz, Tim West, Tom Chae, Jimmy Tran and Trevor Pope, appears to be having quite a good time early on Day 2. Topics of discussion have included Wright and Katz swapping clothing styles among other things. Down to just over 28,000 Wright took a look at one of his cards and saw it to be the K . Pope had raised to 2,500 from the cutoff, Tran called from the button, Katz called from the small blind and Weight moved all-in from the big blind. “I only looked at one card,” Wright told his table. But Pope, Tran and Katz decided that moment was not the time to call Wright’s all in and folded their hands. “Let’s see what the other card was,” Pope said as wright moved his chips back across the betting ling. Without looking Wright flashed his other hole card to the table, the K .
“I didn’t look at it,” Wright told the table of his pocket Kings and then proceeded to fist bump Katz. The entire table appears to have a good time. Okay, here’s an interesting hand. 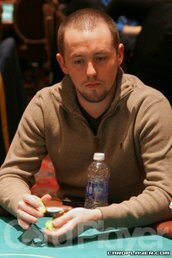 Kevin Calenzo opens to 11,000 and Cary Katz calls from the button on the short stack. Brad Booth then raises to 22,000 from the small blind. Calenzo calls and Katz counts down his stack. He has only 19,000 behind the call, so he decides to raise to 33,000, leaving himself with 8,000, “for a continuation bet.” Booth then reraises to 44,000 and Calenzo moves all in. Katz calls off the rest of his short stack and Booth does as well for about 130,000. Booth shows K K , but he’s upset when he sees Calenzo’s A A . He is even more upset to see Catz’s K Q , taking away one of his outs. The board runs out 7 6 6 7 4 and Booth and Catz are eliminated. Catz finishes in 23rd place and Booth in 22nd, each earning $12,047. Calenzo now has 335,000 in chips. On a flop of K J 7 , Adam Levy was all in and called by Cary Katz. Levy showed pocket sevens for bottom set, but Katz was drawing very live with J 8 . The turn and river fell 10 9 and Katz made his flush to send Levy to the rail. Lauren Kling was all in holding K J and looking for a double up, but her opponent’s pocket tens held to send her packing. There were three members of the November Nine when we started play today. Now that Soi Nguyen, Joseph Cheong and Matt Jarvis have been eliminated, we are down to none. Maybe we’ll get some more tomorrow. 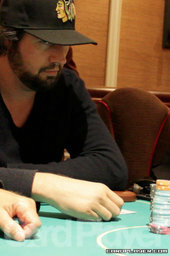 Joe Tehan opened for 34,000 and Jason Mercier called on the button. Cary Katz then moved all in from the big blind for an additional 218,000 and Tehan folded. Mercier thought it over for a few minutes before making the call and tabled pocket fives. Katz held A Q for the two overs, but given his facial expression, you may have thought he was a 100-1 dog. Sure enough, the board fell K J 7 8 J and Katz was eliminated. After the hand, Katz shrugged and said, “This kid never loses a race.” We’re pretty sure that isn’t true, but you wouldn’t know it by how the day has gone for Mercier. Eric “sheets” Haber raised to 22,000 and Pete DeBest moved all in behind him for his last 80,000 or so. 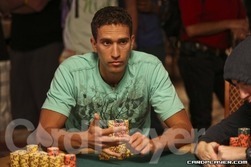 Cary Katz then moved all in to isolate for 125,000, but Haber was interested in folding. Haber called and showed pocket kings, but they were only ahead of DeBest and his pocket treys. Katz showed the superior pocket aces and took down the pot after flopping an ace. Debest was eliminated and Haber was left with just five big blinds or so. After several preflop raises, Shawn Cunix, Cary Katz and Alex Kamberis found all the money in the middle of the table. Cunix showed pocket jacks, but he was bested by Kamberis and his pocket kings. Katz did them one better by showing down pocket aces. Nonetheless, the board ran out A-J-X-K-J and both Katz and Kamberis lost with full houses to Cunix and his quad jacks. All three players are still in, but Kamberis is now in trouble with 35,000. Katz has 110,000 and Cunix triples up to 155,000.